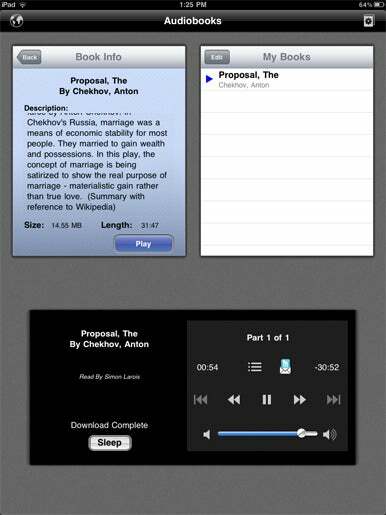 Audiobooks (iPad Edition) is a $1 app from Cross Forward Consulting. The developer says the app provides access to nearly 3,000 audiobooks—all told, more than 20,000 hours of audio. All the books offered within Audiobooks are in the public domain, including the works of Mark Twain, Jane Austen, Charles Dickens, Fyodor Dostoyevsky, and William Shakespeare. The recordings that the app links to all come from LibriVox, a service that offers free, community-recorded audio files for such books that are no longer covered by intellectual property rights protection. So you won’t find the latest Jonathan Franzen novel, and the narrations may not be entirely professional, but the half-dozen recordings I checked out sounded just fine. Triple Play: Audiobooks (iPad Edition) features three panes—a Browse module for finding books, a My Books section that stores your selections, and playback controls. Audiobooks’s interface consists of a single, three-paneled screen: the Browse module, the My Books module, and the playback section. The Browse module lets you navigate books by title, author, narrator, language, genre, and popularity. Astonishingly, though, the app lacks any interface to search books. Your sole option is to browse titles (or authors, or genres) alphabetically. This oversight strikes me as a major one, and I hope that the developers correct it one of these days. Navigation within the Browse panel is fairly annoying, because the app fails to remember your scroll position. That is, if you’re looking at authors whose last names begin with S and tap into one, and then tap back, you’ll be back at the top of the author list (9/11 Commission). When you do find a book you’re interested in and tap on it, you’re offered a brief description, generally excerpted from Wikipedia. You’re also able to review the audio’s file size and running time. Note that longer books can quickly pass the 100 MB barrier; Dickens’s Great Expectations requires half a gigabyte of space and more than 20 hours of listening time. If you decide you want to listen to a book, you tap the Play button, which adds it to the My Books module on the right. In yet another frustration, Audiobooks doesn’t let you add books to that My Books queue in the background while you’re listening to another title. Instead, it stops the story you’re listening to and immediately starts playing the new one, which seems like a misstep. The playback module on the bottom of the screen handles the rest of the app’s functionality. You can start (or stop) the download of required audio files for the book you’re listening to. Of course, there are also playback controls to fast forward, rewind, and pause, along with buttons to navigate chapters. Chapters may not always be true book chapters, but are rather separately recorded chunks of the book. You can navigate to a specific chapter, if you’d like. Another button lets you tweet about the book you’re listening to, or e-mail a friend about it. While I’d never use it, the app also sports a Sleep button, which reads the book aloud to you for 15 minutes, 30 minutes, or an hour, depending on your selection, before automatically stopping. That would be far too frustrating for me, since I’d hate to fall asleep during the reading and need to rewind when I picked back up the next day. Audiobooks automatically remembers your location if you quit the app while listening to a story, and by default it automatically resumes playback when you relaunch the app, though you can disable that option. The app hasn’t been updated to support iOS 4.2’s multitasking on the iPad, so you can’t quit the app and keep listening to your book. The app does include an embedded Web browser, which lets you surf as it reads to you. All told, I came away disappointed with my Audiobooks experience, but the app’s still worth a gander if you’re a fan of recorded books and public domain literature. For a true endorsement, though, the developer will need to spend some time filling in some obvious holes.